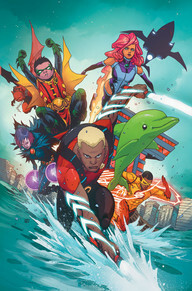 With the Ra’s al ghul event behind them the Teen Titans are on R and R for the moment, but that doesn’t last for long when a mysterious figure beings to make a move against them. The start of the issue we get a clue of the possible antagonist in the upcoming arc, in Del Sur Penitentiary north of San Francisco there’s a breakout and the unknown jailer escapes by jumping into sea after blowing a hole in the walk of his or her cell, I’m pretty sure the person behind this is the main villain so now its just a matter of time when he or she will reveal themselves. Majority of the issue focuses on Aqulad’s backstory, while the Titans are dealing with a surprise interview from Bonnie Chung of Kare 7 News which was setup by beast boy, we see Jackson Hyde (Aqulad) in his room playing around with his abilities. His mother enters and schools him about using his powers in the open, she is worried about the danger it’ll cause if the public knew who he was. Like most teenagers with powers he struggles with keeping it a secret from his friends. So one night Aqulad decides to reveal his powers to his friend Kenny thinking that it would matter to him, but Kenny rejects him and ends their friendship immediately. Meanwhile things pick up back at Titan tower with Bonnie Chung finishing her interview with the Teen Titans and is about to leave but something grabs her and takes her to an underwater prison underneath Alcatraz. With Bonnie Chung missing the Titans jump to action, they search and scout area around Alcatraz and come up with nothing, until Beast Boy encounters King Shark, who was the inmate that was hint to escaped in the beginning of the issue. Conclusion: This was an opener for the upcoming arc the flow of this issue was a little smoother. Like most arcs reaching its conclusion there’s going to be an issue featuring some down time, where the team or individual is doing non-hero actives. 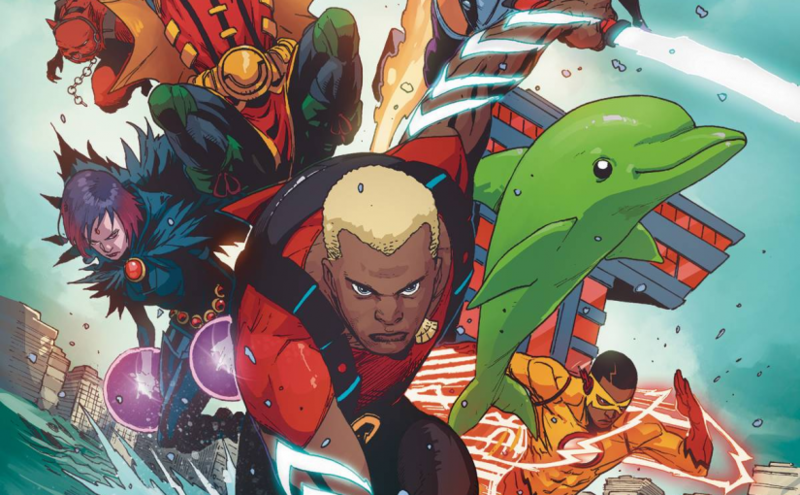 However, we do get an introduction of Aqulad, many fans express their concerns about the arc focusing too much on Damian, but this issue doesn’t, and that’s a good sign for future issues. Previous Previous post: Spider-Man Homecoming (2017) Official Trailer is here!!! !